You might have considered buying a smartwatch recently - there are lots of good models out there at the moment. 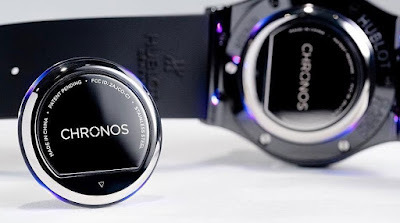 However, if you love your old school watch just a bit too much, and could never dare part with it, the Chronos could help give it a smart update. The Chronos is a Bluetooth connected device that attaches to the underside of a traditional non-smart watch. Working with an app on your phone, it can then vibrate when you receive a call or message, or even light up using LEDs at the edges. Unlike an actual smartwatch, there is no screen to display notifications, and instead everything is configured in the app so you know what a certain kind of vibration means, or indeed what colour from the LED relates to. We're not sure how this would feel to wear, however; after all, you are essentially sticking a chunk of metal between you and your favourite watch. Still, for smart functions on a dumb watch, it seems pretty cool.